Some Arial with your Big Mac? 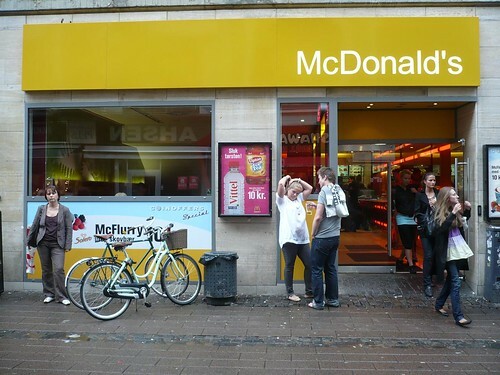 On my recent 4-day visit to Copenhagen I was strolling down Strøget (the world’s longest pedestrian street) I came across this McDonald’s restaurant. Somehow the typography on the sign looked wrong, it was as if someone got a corrupt PDF file and made the sign in a system font instead of the real one. At the time I wondered if it was Arial. Kai Bernau and Susana Carvalho, my favourite people in the type business, confirmed my suspicions: according to Kai, it boasts (McDonald’s always boasts) “Arial and a straight quote. Classy, but somewhat fitting.” They both agreed Ellen Lupton should know about it, and that she “will get a fit over this” when she does. Part of McDonald’s “cool redesign” for the European market, this sign comes with Arne Jacobsen (the Swan and Ant chair architect, whose famous SAS hotel building you can actually see from this street) chairs, darker tones and wood “touches” on its interiors — judging from the sign, maybe not in this restaurant. I didn’t go in, I usually demand typography of a better kind with my fast food.